The hospitality industry includes restaurants, cafes, caterers, clubs, pubs and hotels. It ranges from family-run coffee shops to five-star resorts. There are more than 10,000 cafes and 1000 catering businesses in NSW. Together they employ about 60,000 workers. The NSW hotel industry employs over 50,000 workers and clubs employ more than 40,000 workers. Many of the workers in hospitality are considered vulnerable workers and generally work part-time, late nights and weekends. Many come from multi-cultural backgrounds and speak limited English. Over the past three years more than 18,000 workers were injured in the NSW hospitality industry. More than 250 were permanently disabled and eight died. Manual handling injuries, such as sprains and strains, account for about one-third of all injuries in the NSW hospitality industry. This video series demonstrates safe work procedures for room attendants. Burns are also commonplace. There were more than 1500 burn injuries over the past three years, caused by hazardous chemicals, boiling liquids, stress, fatigue and the like. The video below shows you how to work safely with hot oil. Simple safety measures can help reduce the risk of injury in the workplace. 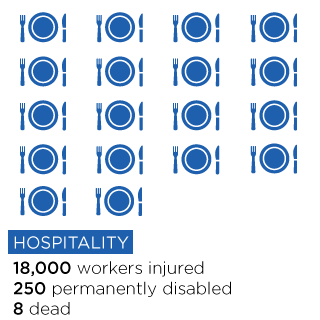 Below are some examples of serious workplace injury in the hospitality industry. A kitchen assistant in a large club had her arm crushed while preparing desserts in a large mixing machine with no guard or automatic off-switch. Noticing a hair in the mixture, she leaned forward to remove it, slipped and had her arm crushed by the mixer’s revolving dough hook. A 19 year-old part-time restaurant employee was electrocuted when he touched a live electrical cable while cleaning a clamshell grill. The company was fined $120,000 and, according to the judgement, simple remedial steps would have prevented the accident. A worker was burnt in the face and permanently blinded in one eye while cleaning beer lines with chemicals. The chemical was not properly diluted and personal protective equipment was not worn. Mary had headaches, felt irritable and experienced ringing in her ears after local bands played during her shifts as a part-time bar attendant in a local hotel. We offer a range of services to help you improve safety in your workplace. Service NSW provides information about opening a cafe, restaurant or small bar in NSW.